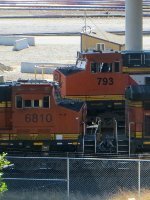 Description: Assorted engines on their way out of Mid-America Car & Locomotive in Kansas City. Description: Serial Number, 60547 Built, October 2011 for BNSF. Description: Heard the BNSF 6810 get permission to head up to Ulen last nite, so today after lunch I came up here and found this gem sitting here waiting to head south once the unit fertilizer train is MT. Title: BNSF 6810 rolling westbound. Description: BNSF wide nose GE roaring through downtown Flagstaff, AZ. Description: BNSF ES44C4 #6810 trails on a stack train as it rolls through Fullerton. Description: A BNSF stack train rolls through Fullerton with typical GE power up front. Title: BNSF 6810 Leads a WB q train. Description: A hot Q train waste no time making the 55Mph track speed into ottawa Ks.